1. The first benefit is an obvious one it’s saving you loads of money each year with the insulation and will have a better-controlled temperature for the summer so it doesn’t get too hot and will be cosy warm during the winter. 2. Acoustics, the sound of your conservatory will have a noticeable difference in sound and will be for the better as it will just be a lot quieter inside and will not make a huge noise while raining, you will also a slight difference in echo as the solid roof will cushion the sound instead of the glass just bouncing it right back. 3. Aesthetically, Tiled roofs come in a variety of colours and styles so no matter what your home looks like you can always match it with what we have. It also makes your conservatory look like it is a permanent add on to the house. 4. Adds Value to your home, and will be a nice amount as well, because it will improve your energy rating and because your conservatory will be a selling point it could even reduce the time it takes to sell. It is an investment and you will definitely see that money again whether you are going to sell the house or not you will see a difference in rather the selling price of the house or a difference in household bills once the tiled roof is installed. 5. Using skylights to your advantage, You can now still have natural sunlight coming in with skylights which is just a glass panel put into the roof that allows light to come through but you still get all the advantages from the old conservatory roofs and new solid ones as well. 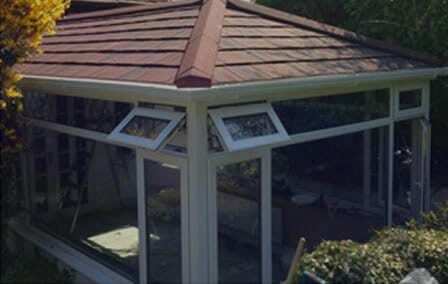 It is a huge benefit to have as it’s like a hybrid of conservatory roofs. 6. Also the tiled roof prevents condensation and any problems relating to a build up of dampness within the roof. Having different conservatories might have different benefits like let in more natural light if you have a Victorian conservatory or the sound might be better in a gable end, but we can let you know about these when you get in touch with us. Getting in contact with us will give you a better idea of what price it will be for the work you need to be done and how long it will take.